As you might have noticed, by my lack of blog posts last week, I have been busy around this place. We’ve been working diligently at getting the tree in the back yard cut down, the branches chipped, and the gardens set up. So much so that we’ve actually neglected a few other things around here. Things like ordering a car seat for baby number three as well as our birth kit. I’m in my third trimester now, and we have pretty much nothing set up for the baby yet. Here’s what we have been doing though. Rick and the neighbor, Doug, got the wood chipper working and made short work of nine of the eleven piles of branches in the yard. The other two piles were too big to put through the chipper, so they’ll have to wait. There’s still more of the tree to cut down, but the weather has been uncooperative (too windy) to take down the tallest parts. Hopefully this week, before the tree leafs out! After expressing how chicken wire works just fine to protect your flock from predators, we lost two hens to a fox. Now to our… erm… credit? shame? it wasn’t a failure of the chicken wire, so much as a failure to close up the coop at night. I confess to being a lazy chicken owner, and leaving the coop open much of the time. The hens put themselves to bed, and Josie, our big mutt, used to really help in keeping predators away. But this is the first spring we are without her, and I really wasn’t thinking much about it until I found a hen dead one morning last week. She was headless and we’re pretty sure Rick scared the fox away when he was leaving for work. Somehow, neither of us heard a commotion in the coop, but it was windy and Rick thought he had heard the kids’ tent blowing around. Turns out it was probably a chicken scuffle. We of course cleaned up the mess, and that evening, just around sunset, when Rick went out to close the coop, he found dead hen number two. It had JUST happened. The neighbor had scared the fox as they walked by. We think that the fox might have been coming back for the first hen that it left, and since it was gone, it killed another. 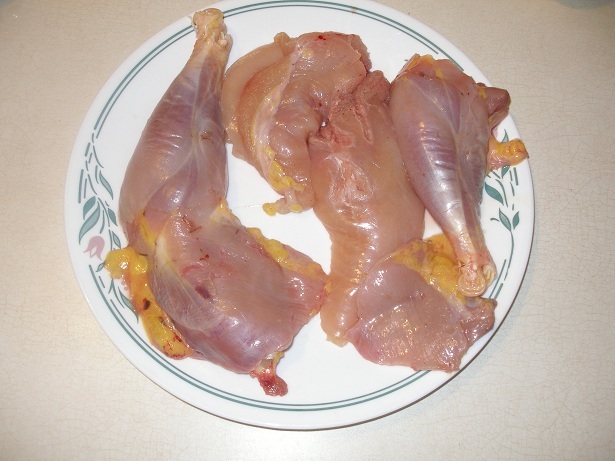 Since we found this one fresh – very very fresh, Rick butchered her up (discarding the part where the fox bit her – just her back) and we made chicken and dumplings. She was actually our oldest hen, and I don’t think any amount of stewing would have made her legs edible – think really tough chicken jerky. But we tried at least, and her breast meat was ok, and she made tasty broth. The good news on the chicken front is we’re pretty sure those were the two hens that were eating eggs, and the older hen really wasn’t laying much at all anymore, so the fox saved us some trouble of getting up the nerve to off them ourselves. We’ve not had anymore broken or eaten eggs, and our egg numbers are still about what they were, since now we’re getting them all instead of racing to beat the hens. 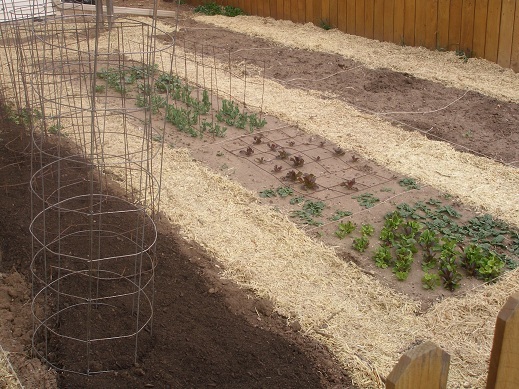 AND the chicken wire is still doing it’s job, as long as we keep doing ours. This weekend we spread the wood chips to mulch the garden paths. Our neighbor watched over the fence. I know he thinks we’re crazy for going to the effort to mulch the tree instead of just hauling it to the dump, but I’m happy it’s going to good use, and hopefully it’ll work at keeping weeds down between the beds. Otherwise, we made a trip to the garden center to get our tomato and pepper plants. I’m excited to try a couple varieties that we’ve not done before. I spent some time spreading compost in my tomato bed and the plants are hardening off this week to get ready to go to the ground this weekend. I’m chomping at t he bit to get the summer things in the ground. Just waiting for the weather to get on board too. So this week I plan to get a few more things outside organized, but I also am going to try to focus on a few inside projects as well. Like laundry and getting the baby’s room emptied. There needs to be a balance, I know. The to-do list seems never ending this spring. But little by little we seem to be getting items crossed off. Sorry about the chickens, but glad there was a silver lining for you. 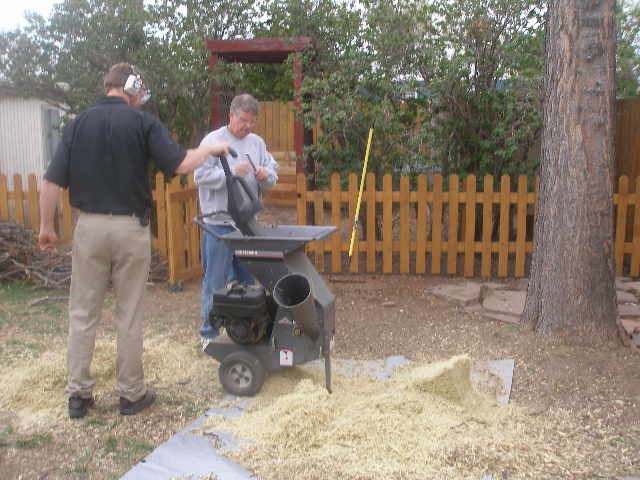 I loved using our old wood chips for stuff when we were first cleaning up here, but now there’s not enough to matter so I got rid of the chipper. Jenny – I have a couple pictures I was saving for my mom – they are of the undeveloped eggs inside the chicken. Little tiny yolks all the way up to nearly ready yolks. It was the coolest thing! AND you had time to post it? Wow. Any chance we could borrow your chipper some time? I have a bunch of smaller branches, etc., that I’d like to chip and haven’t found an easy place to rent one. Yes – we’ll figure out something. I don’t think it will fit in our 4Runner – but we’ll get it worked out one way or another.